We like to believe that because we are making business decisions, we do so rationally. We analyze the information, seek more information, discuss our ideas with others, then make a sound fact-based decision. The truth is that we make our initial judgments about almost everything in our amygdala, the neural centers in the limbic system linked to emotion. As Jonathan Haidt explains in The Righteous Mind, the purpose of the rational mind is often to act as a lawyer who will justify our prejudgments. We don’t mean to say people don’t make rational decisions. We do, but our first reaction is not likely to be rational, and we may not even be aware of it. That is why we spend so much time on cultivating alliances, learning the decision process, and understanding what drives the way decision-makers think. You will need to align your efforts with their priorities to improve your chances of a positive initial reaction. The first step in developing a sound business case is to learn the language, and the lexicon of business is Finance. If you are new to Finance, you can take free online courses from major universities or take a course at your local business school. Learn the language and leave HR-speak in your office. Seek people in your organization who have had success in getting proposals approved. If your company has a formal review process, learn how it works. Find out if reviews are on a regular schedule or if they happen when proposal come up. Learn whether your company reviews functional portfolios or individual cases. Learn who makes the final decision and what their priorities are. If you don’t get a good idea by asking, review previous projects to see who approved them and why. The final decision authority may be the CEO, CFO, or a group of executives. Your case may be reviewed at several levels before it reaches the final authority, and you will need to understand how to negotiate each level. Find out who has influence, and build your idea around the influencers’ priorities. Seek an executive sponsor or champion. Somewhere in your organization is an operational leader who will support your ideas. Engage that person in conversations about organizational performance and how you can help. That person may have a problem your idea will solve. Study the factors driving decisions in the business. If you can’t get the information directly, read financial reports, shareholder communications, and internal communications. Recent news article can also help. If you can, learn what is keeping decision-makers awake at night. Build your idea around your organization’s strategy. If it is developing new products, your product managers will need talented people to do the work. If it is cost-cutting, your proposal should be focused on efficiencies. We have already mentioned that you need an executive sponsor, but there are other allies you need on your team. Writing a business case proposal isn’t easy, especially for those of us who are “people people” and not inclined to love numbers. That doesn’t mean you need to become an accountant. You only need to get Finance on your team. Nothing gets attention like a business problem with financial impact. Seek operational leaders who can benefit from your ideas. Talk about how you might help them get better results. They will become your champions. You may need external experts if you do not have in-house capability. Vendors, industry experts, and colleagues may be of help. Don’t go it alone, and don’t overlook the expertise in other areas of the business. 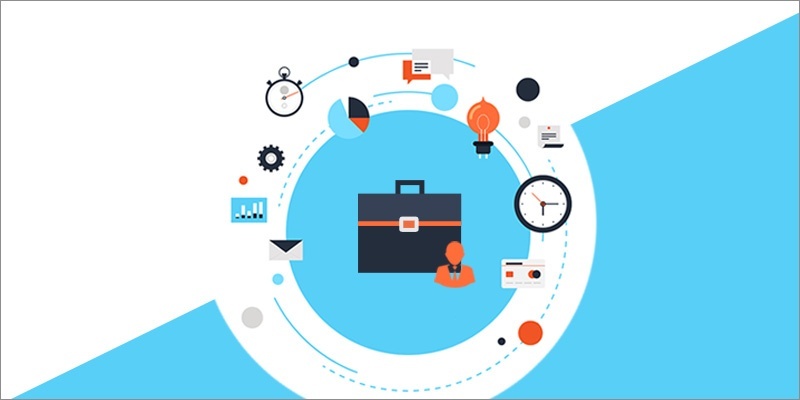 In our previous article, we discussed the need to influence decision-makers and the need to form alliances when you are preparing a business case for a human capital initiative. Today’s article is about building the business case for your proposal. The first step is to frame the business need. In Part 1 of this series, we discussed the need to form alliances with operational business leaders who may have a problem we can help solve. Here are a few simple examples. We are losing people to our competitor. Unplanned absences are disrupting production. We don’t know who are high potential employees are. People on the sales floor are not cross-selling. We can’t find qualified technicians. Define the need and frame it in terms of your business strategy. Identify the related key performance indicators (KPIs). You will need to gain the support of the person accountable for the KPIs. Finance. Ask your CFO to designate a representative to guide your team in financial strategy, cost/benefit analysis, forecasting, and ROI calculations. Line of Business. This is an expert in the corporate entity that owns the KPI. It may be experts in sales, production, research, human resources, logistics, or any other function. It may also include other people affected by your proposal. Marketing or Customer Service. If the problem and solution affect customers, you will need an expert who knows them and their needs. Technology. Expertise in this area could include external entities, such as vendors or consultants. Project Management. A project manager will provide expertise on how to analyze and present your proposed activities and manage your resources. Use the expertise on your team to explore why the business need or problem exists. Your organization may use Six Sigma or other disciplines to guide your analysis. Some of the information you need will be in functions other than Human Resources. You may need to correlate sales, revenue, production or logistics data with candidate or employee profiles, learning assessments, or demographic and population data. Work with the owners of the data to gain access. If you are dealing with a process, develop a flow diagram or flowchart to analyze it. Use cause-effect diagrams and interrelationship digraphs to establish relationships and root causes. Document your analysis. You will need to explain how you arrived at your conclusions. Use group brainstorming to generate potential solutions. You have team members from several disciplines, and each will have a different point of view. Bone up on your brainstorming techniques so you get a free flow of ideas. Frame proposed solutions as hypotheses: If we do this, then this will happen. The best place to start might be your null hypothesis, i.e., what happens if we do nothing? Define business results – costs, revenue, market share. You will need to discuss your null hypothesis when you ask for approval. If we do nothing, unplanned absences will continue to impact production. To meet our commitments, we will need to over-staff by 11% with additional employees and overtime. Our production costs will increase by 7%, and net profit will fall by 4%. Use analytical models to test your hypotheses, if you can. If not, let your Finance representative guide your analysis. Evaluate and compare your ideas. For each one, compare cost, revenue, risk, and time to implement. Eliminate or modify proposed solutions that are unfeasible, unacceptable, or not aligned with the business strategy. Work with your executive sponsor to identify which proposals have the best chance of being approved by your executive team. Narrow your list down to the best two or three alternatives, and create a high-level plan for each. The purpose of the high-level plan is to understand the resources required and develop a rough idea of the costs and benefits. It is the who, what, where, when, and how of your proposal. The who is critical at this point because you will need the buy-in and support of the people involved, especially the people who will do the work or provide funding. To construct the high-level plan, list the major activities and milestones in chronological order. For each activity, list who will do what, where, when and how. If you need help, work with your project management expert. In Part 1 of our series on building the business case for your human capital initiatives, we discussed the need to form alliances and influence decision-makers. In Part 2, we showed how to clarify the business need, build the right team, and evaluate solutions. Those discussions prepared you for the number-crunching so essential to a solid business case. Estimating costs and benefits of an investment may seem intimidating for non-financial leaders, but if you have followed along with us you have a team in place, and you have laid the groundwork. Now it is just a matter of following your Finance partner’s guidance. Finance will be your best ally. Your Finance team knows the policies, procedures, and methods you need to follow, and will advise you on how to present your case. You will build relationships that will serve you well. By this time, you should have narrowed your solutions down to the top three. 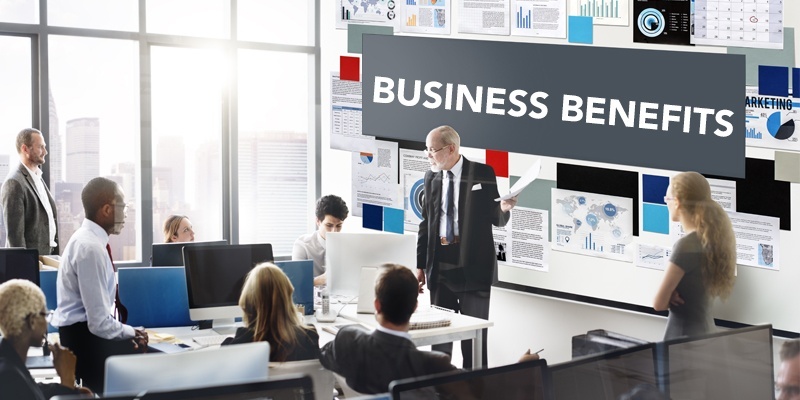 You will need to estimate costs and benefits for each of them, but how much of that analysis you present to your executive team will depend on their preferences. Your CFO and sponsor can guide you. Use your company’s income statement as the format for your estimates. CXOs are accustomed to reading financial statements. They will expect items to be in a particular order and format. You will need to show costs and benefits over a defined planning period. Your company may have a policy for the length of time depending on the type of project you are proposing. Cloud technology has changed the way we estimate ROI for some business applications. Since cloud technology vendors are constantly updating their platforms, the life cycle is theoretically infinite. Most companies have a standard planning period for technology, but it probably should be longer for a cloud subscription than for hardware and infrastructure. Your Finance partner will advise you on the format and planning period for your ROI worksheet. If you don’t have a standard format, you can use the sample below. The purpose of the ROI worksheet is to capture your costs and benefits in one place. Your worksheet will have dozens of hundreds of individual cost and expense lines (Please click on tab to download free ROI worksheet). Accountants break down costs into two areas: project costs and operating expenses. To estimate total cost, include all the expenses necessary to implement the solution, including the capital costs of acquiring assets. Project costs are usually simple. They include personnel, travel, consulting, and any other expenses that are not used to purchase an asset. Calculating capital costs require the expertise of your Finance partner. Amortization rules are complex. You may need to show the cost of an asset in the first year, or you may need to spread it out over a depreciation period. Transition costs are the result of temporary disruption. Include spikes in support calls, one-time training costs, and temporary dips in productivity. Explore the concept with your experts to make sure you capture realistic estimates. To calculate operating cost, you will need to consider the cost of maintenance, licensing, support, facilities, training, and any other ongoing cost. Consider also costs that other business unit may incur and be sure to discuss them with the business unit before you present your case. Some initiatives will lower operating costs. Be sure to include those in your calculations. If you are automating or improving a process, you may have labor savings you can add in the benefits. Estimating the benefits of a human capital management initiative is not an exact science, but you can do it with the right help. Your line of business partners are equally as important as Finance. They are the people with the operational requirements and tools to estimate the financial impact. For example, if you are implementing mobile learning to deliver just in time training and sales support, you cannot come up with an exact amount of increased revenue – but your sales team is experienced in forecasting. Work with them to develop best-case worst-case, and most likely case assumptions. Present all three estimates when you make your pitch for approval, and capture the source and rationale for the numbers so you can refer to it when a reviewer challenges your numbers. Quality and frequency of manager support impacts performance in customer service. Can the customer service team help you estimate the impact of leadership training? Can Marketing then assess changes in consumer behavior? What will be the financial impact on time to productivity for a production team when you implement a new onboarding program? An improvement in tracking required training can impact risk exposure. Your risk manager may quantify the value of reduced liability risk and its impact on insurance rates. If you cannot quantify intangible benefits, do not use them in your estimates. You can, however, use them in your presentation pitch. There will be benefits you cannot predict, but can measure. Mention those also, but do not include them in your estimates. If you do not have a human capital analytics team, you may get help from Marketing and Finance. They have been using predictive analytics for a long time, and may have the resources to help you predict outcomes. This may be the opportunity you need to begin working on your own analytics initiative. The ability to predict with accuracy the impact of people on the organization is an important step in creating a data-driven culture.. Productivity presents a different challenge. One of the most common arguments we hear for automation is that it will free up administrative personnel to do more productive work. That is not a productivity gain – it is a reallocation of resources. Also, you may need to upgrade your staff because “more productive work” requires a new skill set. Whenever you introduce new technology, someone must manage it. You may have a productivity loss to add to expenses. Map and analyze the processes your initiative will touch. Small changes to a process can often result in significant savings in rework, administrative costs, materials, and labor. Make sure the executive leaders responsible for outcomes will stand behind the numbers. Just asking an exec to verify the numbers may get you a more realistic estimate. This is the fifth in a series of article about building the business case for human capital management initiatives. We discussed costs in Part 3 and benefits in Part 4. We also explained how working with Finance and Line of Business (LOB) leaders will help you estimate the financial impact of human capital programs. Today we will show how to calculate ROI and the payback period. Which method you use will depend on the type of initiative you are planning and what your business practices require. If your organization has a procedure and format preparing your case may be a matter of entering information in a template. Your partner in Finance will help you chart the right course. You will also lay the groundwork for your CFO to support your initiative. Your ROI Worksheet is the source document for ROI calculations. We have showed you how to use the worksheet as a working model to capture costs and benefits. We will now dig into the actual calculation to present to your approvers. Payback period answers the question: when will we recoup our investment? In this method, calculate the values for each year until you see a positive cash flow. Your business may require that you calculate the payback period beginning at the time you launch the project, or it may begin at the end of the project. We have provided a sample worksheet for each case. We have also provided a sample based on a phased implementation. In the second type of calculation we show ROI calculation beginning at project start. This worksheet shows the annual project costs. The benefits begin in the year the project is complete. Since many implementations take only a few months, there could be benefits in the first year. Our example shows a project completing in 18 months. Many companies decide to implement a multi-module platform over several years. In that case, benefits might begin the first year, but will grow over time as additional modules come online. You may need to present a thorough analysis of more than one option. For example, if you are preparing a case for new talent management technology, you may have some approvers who favor best-of-breed solutions while others prefer a unified platform. Regardless of which you prefer, the best approach is to present both cases in depth. 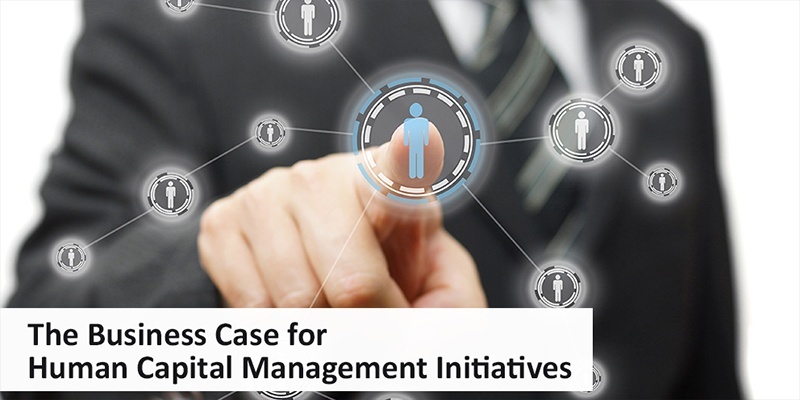 This is the sixth in a series of articles about building the business case for human capital management initiatives. In our previous article, we showed how to use several methods to calculate return on investment. The ROI you calculate assumes everything will go as planned. What if it doesn’t? What if the project schedule changes? What if your organization delays funding? What if you must replace a key team member? What if…? Calculating and managing risk is an essential feature of every proposed initiative or project in any business activity. Standard practice is to assign an impact rating to a risk, then estimate the probability or likelihood that the event will happen. The following tables give you an idea how to construct your rating values. Note that a risk factor with a 100% probability is not a risk – it is a certainty. 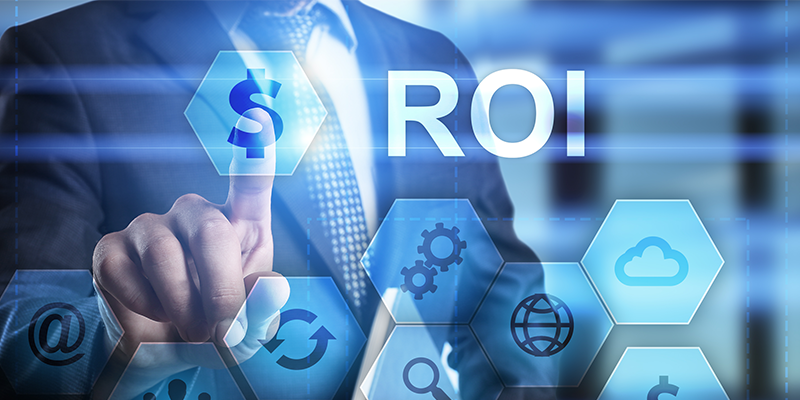 Build it into your ROI analysis and implementation plan. 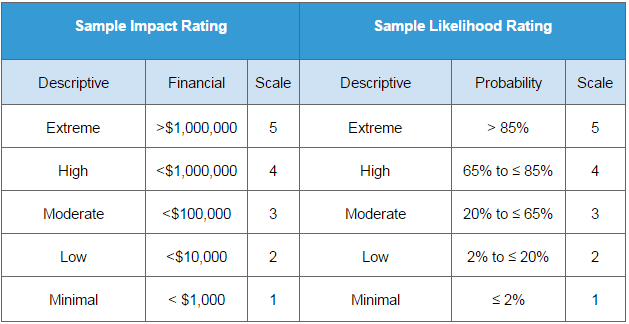 After you assign impact and probability scores, multiply them to arrive at a Risk Score. Some project teams like to assign colors to risks levels to help them see at a glance where they need to focus their mitigation effort. Thoroughly explore the impact of each risk. 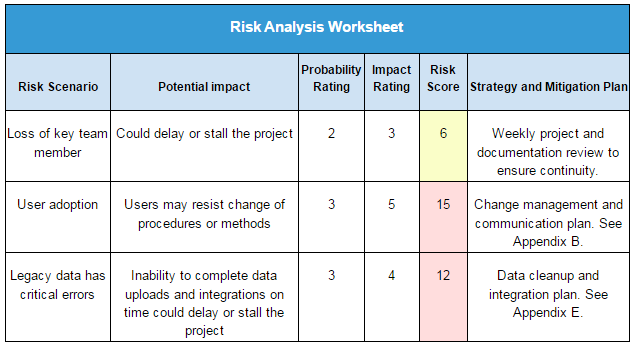 Describe each risk scenario and its implications in a Risk Analysis Worksheet. Plan whether to avoid, transfer, or mitigate the risk. Document the strategy and mitigation plan for each risk. Your ROI worksheet can help you calculate the impact of risks.1 In the next sample worksheet, we show a project that requires 18 months to implement, so benefits begin halfway through year 2. If the project is delayed by six months at a cost of $100,000, the benefits will not start until the beginning of Year 3, so the project will not recover its cost until Year 7. When you present your risk analysis to your executive team, be straightforward about the potential impact and your limitations. You may find help where you least expect it. evaluate, calculate, and mitigate risks. You now have a solid foundation and the information you need to prepare a winning business case. Your organization’s business practices will define how you shape and deliver your business case. Large organizations are likely to have a very rigid, prescribed format. Smaller companies may define it loosely or not at all. Work with your executive sponsor to structure your case. Your sponsor knows what your leaders want to see. Study other cases -- both approved and rejected proposals. You may learn more from failures than successes. If you don’t have a prescribed format, you can use the structure outlined here. The executive summary may be the only thing decision makers read. Tell a brief, compelling story of how you identified a business need and developed a solution. Describe the business need and potential impact on the business. Describe the solution and how it will solve the business need. State the project cost and ROI. If you are using the payback period ROI method, state how long until the project pays for itself. Describe the problem or opportunity and link it to the business strategy. Describe the solution and why you choose it. List alternatives and why you did not choose them. State the impact of doing nothing. 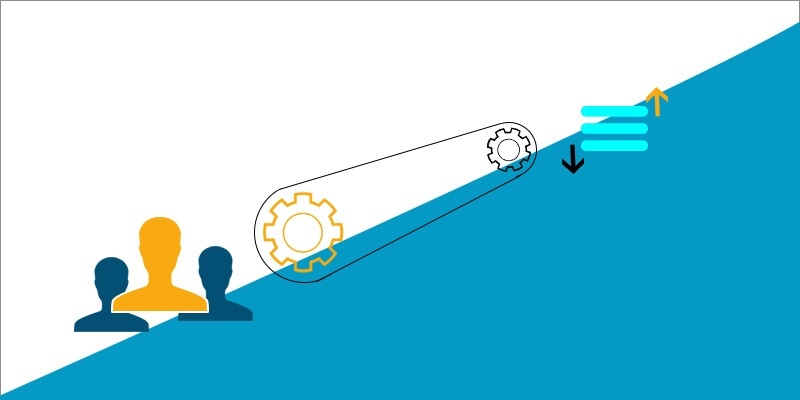 Describe what business process the change affects and how. Describe major milestones and deliverables. Identify team members, business functions, and external entities and the roles of each. Describe the impact on the company. Link each benefit to a key performance indicator (KPI) and the strategic plan. Discuss your risk analysis and mitigation plan. Include your risk analysis worksheet in the appendices. State the ROI, payback period, or net present value, whichever is appropriate. Discuss the factors in ROI calculation and the rationale for estimates. Include a summary ROI calculation worksheet. Add the detailed ROI spreadsheet as an appendix. State why the solution will work. Be ruthless in your editing. Remove every unnecessary word, and don’t jazz up your language with long, complicated words. Where a simple word will suffice, use it. Make sure each idea flows into the next, moving readers to the final decision. 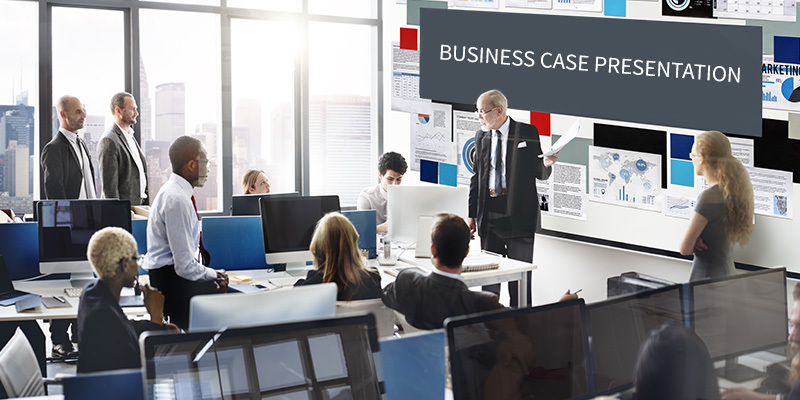 Your presentation should be a summary of your business case document. Avoid animations and gimmicks. Your purpose is to make an appeal that will engage your audience’s emotions. Instead of trying to entertain, seek to engage with simple, direct language. Do not use paragraphs of text. People do not want to read your slides. They want to glance at them to grasp the central ideas. Use simple charts and graphs that clearly convey a single message. Try to keep phrases and bullet points to six words or less and present no more than four ideas on one slide. Remove articles (a, an, the). Avoid clutter. Keep presentations clean and crisp, especially if you are presenting to remote users who might use mobile devices. Do not use stock photos unless they are relevant and advance the story. Marketing research has shown they can be a negative distraction. Review your case with your sponsor, your Finance partner, and your LoB partners. Use their suggestions to fine tune your presentation and tighten up weak areas. Ask your sponsor to give you information on the personalities in the review committee. Study their strategic plans and priorities. Understand their concerns and address them in your presentation. If you can, learn what their “hot buttons” are, both positive and adverse. If you present your case in person, practice your delivery in front of a critical live audience. Ask your test audience to question your assumptions, jump ahead or back in the presentation, and interrupt. Practice using the multimedia technology, and prepare for it to go wrong. Make eye contact with each person in the room for short intervals. Pause for a few seconds before you answer a question, then nod slightly. It signals you heard the question and can respond – and gives you time to think. To avoid the newbie shuffle, plant your feet. If you move, pick a spot and move to it, then plant your feet again. Practice not looking at your presentation screen. Be like Mike. Practice enough so you won’t make a mistake. When you make your pitch, remember to face challenges If you are presenting your case to busy people. They may not be a willing, attentive audience. It could be a group of executives who are reviewing 30 other cases along with yours. Here are a few things we can share from our experience. Understand their impatience. It is not personal. They may be distracted by a business problem. Do not give them anything to read until you finish. If you do, they will read the summary, glance at the ROI calculation, then start checking their messages or find an excuse to leave. There will be a “gunslinger” waiting to shoot down your proposal at the first opportunity. Do your homework and anticipate the challenge. Be flexible. You may have 20 minutes on the agenda, but you could get only five. They might hold you for an hour. Identify in advance which slides you will use if your time is cut. You may have time only for the executive summary and ROI slide, or only the summary. If your opening statement is a compelling message and the numbers work, you are on your way to approval.